Baghdad 2003. Lina is living with her father, a university professor, and dreaming about becoming an architect. Her mother, a successful lawyer, has disappeared four years earlier, taken on her way home from work, never to be seen or heard from again. Rumors of war are getting louder by the minute, but Lina’s father refuses to leave Baghdad in case her mother returns. When the bombs begin to fall and foreign soldiers become a part of everyday life, one by one Lina’s dreams start crumbling around her, until she has nothing left but desperate hope tied to an impossible boy. Night after night, far too many nights for me to remember, or want to remember, the bombing continued. And with every bang, every crash, every explosion, I waited, expecting our house to be hit. For my world to end. I couldn’t think about tomorrow, that maybe next it was my turn to die. The beginning of Lina’s story was strongly reminiscent of Lena’s story in Between Shades of Gray, and not just because of their names. It felt almost like reading Between Shades of Gray: Iraqi edition, and I had fun comparing the two for a while, but I was glad when they diverged after the first few chapters. As much as I loved Between Shades of Gray, I like diversity even more. Lina’s account was interrupted a few times by very short chapters that focused on her mother’s disappearance in 1999. Interrupting a first person narrative with occasional chapters in third person and from a different point of view is a narrative technique I don’t particularly care for, so I was both dazed and dismayed when Drewery abandoned Lina suddenly and in a very difficult moment to give us three pages about her mother being captured four years earlier. The first time was the hardest because it followed a very emotional scene and I had a hard time adjusting to the sudden change, but it was difficult even later, when I knew to expect it. I can think of a few better ways to tell the same story, and I wish one of them had been chosen instead. I can’t shake the feeling that it was simply too early for this book. Perhaps I’m wrong, but it was clear that the author strived for impartiality, and with wars, that sort of thing requires a lot of time and emotional distance, if it is ever even possible. I understand the appeal, the need to go where no YA author has gone before, but I also understand that sometimes you just bite off more than you can chew. No matter how sensitive Drewery’s approach, and no matter how brave she might be for deciding to write this story in the first place, the fact remains that in trying to be impartial, she remained superficial. There are, however, a few things I greatly admire. Drewery’s writing style is clear and concise, but with great emotional depth. The easiness with which I connected with Lina proves that Kerry Drewery is an excellent writer. I’m already excited about her next project. A copy of this book was kindly provided by the publisher, HarperCollins Children’s Books, for review purposes. I've never heard of this book before, but the topic sure does seem like an interesting one. 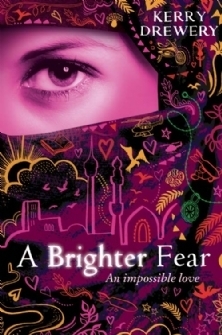 I haven't read many books with war themes in them, so I'm intrigued by Brighter Fear. I have a feeling I wouldn't enjoy the switching of first to third person either. I've only read few books with such a writing style, but I ended up being confused. Interesting review, Maja! I hadn't seen this one before. I might pick it up if it pops up in my library. I do enjoy books with this sort of setting! I was thinking about between the shades the gray when I was reading the synopsis. I was like is A brighter fear the title for anther country. then you said it wasn't and my internal confusion clear! Thanks Maja! Wonderful, honest review! I always liked authors with clear writing styles too! It's always tricky when authors switch between POV's and use different narrative styles. Not everyone can make it work. In fact, I think probably most people can't! I'm really interested by the setting of this one though. I am reading a book set in the middle east right now and that's something I'd really like to read more of. Really? Paper Towns is your favorite? I've only just started so that gives me hope. So far, I loved Alaska the most, and I totally gave up on Katherines. We'll see how it goes with Before You Go. The reviews have been a bit disappointing so far. Ooh I really despise changing from 1st to 3rd person POVs since I read Of Poseidon. Now I can't read it without it truly bugging me. Too bad for the superficiality too I get what you mean. If you want to take a risk, make it passionate you know what I mean. Go all in. I def. love this cover though its super eye catching but I doubt it would be something for me. The changing narrative would most likely bother me too, not to mention the switching points of view. I honestly can't say if this book would go down too well with me - it is very different to what I would normally go for, but at the same time, I like that it is different. First I love the cover it makes me want to shout "Pattern Power" since we started watching Umizoomi I notice all textures and patterns my fav part of the show..ok now to the review, I am sure this book was an eye opening read and it certainly tackles a difficult topic. I was hoping for a big wow...but perhaps you are right it might be too soon...it would be like writing a YA 9/11 book. Still I am sure it has an important message and it is one I would like to check out! Great review, Maja. :) The setting sounds fascinating and the cover of this is brilliant. I'm definitely going to add it to my TBR list, even if you weren't a fan of the switching narratives (which is something I don't favor too). You also reminded me that I must read Between Shades of Gray ASAP! Wonderful review. I definitely understand the issue of impartiality; I think that's something extremely difficult to pull off with something so very recent, and I can see how the attempt might make a book . . . shallower than it could've been. Also, sudden POV changes, particularly when they switch from 1st to 3rd, are almost always a no. It's just too jarring, and really messes with the reader's head. However, this still sounds like an enjoyable book, and one worth the read. Awesome review. I like novels that switch pov's but not sure if I would like it in a book where i am so emotional invested in the main protagonist. I really wish YA writers would give more depth to their books. I might give this a go as a library read. Thanks Lina! Another wonderful review, Maja! This sounds like an emotional read. Changing narratives annoy me, so I'm not sure if this one is for me. I like the fact that the writing is concise along with ease of character connection. Maybe I will give it a try. Thank you for the review! I agree with you, it's too early for this novel. I know I'm not ready to read it, and to be honest I'm not sure I'd ever be interested in going there but... Yeah, definitely not yet. The jumping from first to third and past is only interesting if you really care about what happened back then, or if it's triggered by something that happened in the first person part. Just my humble opinion, though. It sure can be jarring! That said, I will keep an eye on the author, see what else comes about that might be more appealing. If it can connect you to the characters, it must be something worth reading! Beautiful review Maja! I'm wondering what happened to the mother. Probably nothing good. This sounds so heartbreaking and very current. Very brave of the author to tackle such a subject.